So many people I know are dealing with anxiety right now. I’m hearing about it from my clients. From friends and family. And from myself as well! Anxiety is something I know a lot about. It used to be my constant companion. But gradually, with the help of numerous mind-body techniques, I was able to let go, nearly completely, of all anxiety. What a miraculous relief! Lately, though, anxiety has been cropping up for me again. It could be the ever-changing political climate. Could be the numerous disruptions and changes I’ve had to navigate during the last year. Could be a lot of things. The problem is, I DON’T have time for anxiety! Who does? Anxiety gets in the way of my work, my dreams, my creativity, my natural optimism, my happiness…my life! Fortunately, I now have a wealth of tools to clear anxiety, almost immediately. So, unlike years ago, when anxiety was my constant companion, I can now easily release, relax, and let it go. Feels so good! Deep Breathing – Deep breathing, from the abdomen, stimulates the vagus nerve. When you stimulate the vagus nerve, you stimulate the relaxation response. Meditation – Meditation allows you to drop into deeper brain frequencies and relaxation. It is an effective way to observe your discomfort from a place of detachment. Connecting with your higher self, while observing anxiety, helps to diminish it. Meditate in silence, or try a guided meditation. If you’re new to meditation, start with 5-10 minutes and gradually increase the time. For a huge variety of free meditations, check out the app: Insight Timer. 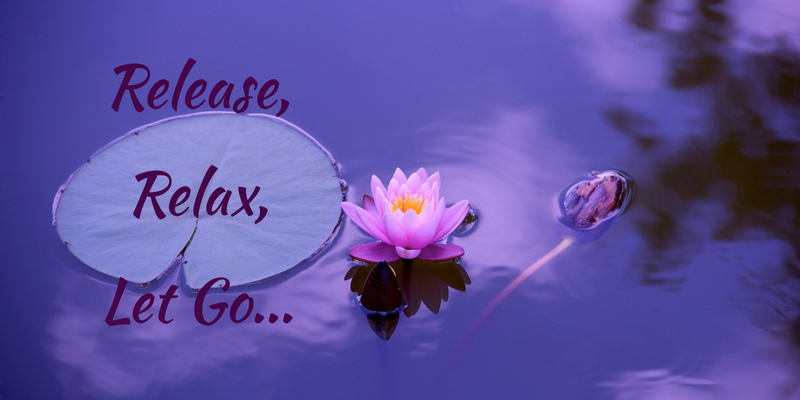 Self-Massage – Self-massage is a quick, powerful way to release pent-up anxiety and tension. Give yourself a quick foot massage, a neck and shoulder massage, a hip massage, a lower back massage, an arm and hand massage. Massage wherever you can reach, wherever you feel tense. It’s amazing how powerful just a few moments of self-massage can be! Tulsi Tea – Mmmm. Tulsi tea is one of my favorites! In fact, as I write this, I’m sipping a cup of Organic India’s Sweet Rose Tulsi. Tulsi tea helps calm jitters, and balance cortisol, the major stress hormone. Eat Green—Green veggies and green juices contain alkalizing minerals which help ground and calm the nervous system. Find your favorite, easiest way of eating greens, and eat plenty of them. Greens are absolutely essential, especially during times of stress. 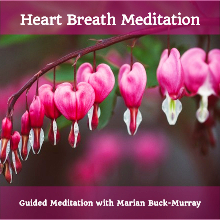 Heart Breath – The heart breath will help you drop out of an anxious mind, into the peace of your heart. To use the Heart Breath, first take 3-4 deep breaths, bringing your breath down into your abdomen. Next, bring your breath up into your heart, and imagine that you are breathing in and out of your heart. Deeply, and slowly. Breathe this way for 1-5 minutes (or more!) Notice how it makes you feel. EFT Tapping – Ahh, EFT Tapping. Again, one of my favorites. (no bias here!) EFT Tapping helps balance and reduce the stress hormone cortisol. It’s a very effective tool for releasing anxiety and panic. The fastest way to use it is to use the fingertips of one hand to tap on the karate chop point of your other hand. The karate chop point is the fleshy part of your hand between your pinky and your wrist. Breathe deeply and slowly as you tap. For more info about all of the tapping points, click here. If you’d like to learn how to use EFT to relieve anxiety, contact me. 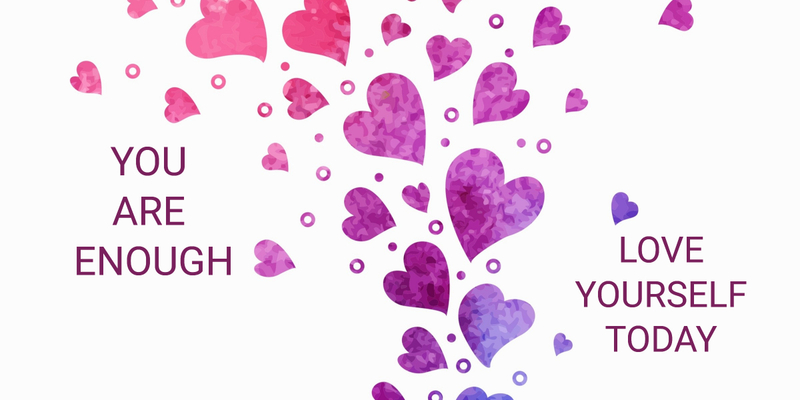 Affirmations – I’ve been using affirmations for a while now, and I LOVE them! I’ve created a number of affirmations for a variety of my goals and desires. So, when I’m feeling anxious or worried, I switch to a positive affirmation to counter my worry. Then, I repeat the affirmation over and over. The more I practice this technique, the more immediate the results. Yoga – Yoga is a fabulous practice to release the tension, anxiety, and fear that gets tapped within the body. If yoga is right for you, find the yoga practice that’s right for you. If you can’t find a class near you, try an online program. Gaia.com has a beautiful selection of yoga teachers and classes. Gratitude List – Sometimes when we feel anxious, it’s because we feel we’re lacking something we need. Cultivate a daily gratitude practice which helps you acknowledge all the good in your life. This sense of gratitude will help you shift out of anxiety. Creative Visualization — Similar to an affirmation, a positive visualization will help you feel more optimistic. If you’re new to visualization, start with simple visions, within the realm of possibility. First, decide what you’d like to see. What would improve your situation? Next, close your eyes, breathe deeply, and bring your vision to mind. Allow the vision to appear in whatever way is best for you. Don’t force it. By allowing yourself to step into a new, better-feeling, possibility, you’ll help yourself feel better, and you’ll show your subconscious mind what to create for you. Brain Wave Entrainment: Brainwave entrainment uses pulsing sounds, lights, or electromagnetic fields to stimulate the brain to fall into deeper, more peaceful, brainwave frequencies. This is a very effective technique, and numerous products are available online, and as MP3 downloads. Because these products are powerful, it’s important to purchase them from a trusted source, and to do your own research on the effects of brain wave entrainment. and Binaural Beats Meditation at: https://www.binauralbeatsmeditation.com. Let go of Caffeine – Last, and certainly not least, let go of Caffeine! Limit or omit it. Caffeine stimulates the adrenal glands, and therefore your stress hormones. If you need an energy boost, try a green drink, or a glass of water with lemon. Life’s too precious to waste it on anxiety! To Apply for a FREE 30-Minute Unleash Your Courage Call, click here. Got Courage? For me, courage is essential for everything from growing my business to living my life in a more authentic, joyful, loving, way. A few months ago I taught a workshop called the Courage Experiment. My goal was to experiment with different courage boosting techniques, and share them with others. Here are 22 techniques I’ve found to be most helpful. Experiment, and discover what works for you. Enjoy! Seek Courageous Role Models – Look around at the people in your life, in the media, in books, and in history. Who are your courageous role models? Learn about the ways in which they use their courage. Adopt strategies that appeal to you. Collect Courage Quotes — Use the internet to find quotes about courage. Collect quotes that really speak to you. Print some out, and post them where you’ll see them. Embrace Your Fear – Feel your fear. Practice sending compassion and understanding to yourself in your moments of fear. Sometimes just pausing with this intention is enough to release fear. Admit to your Fears with a Friend – Sometimes it takes a lot of courage to admit we’re afraid. Fear loves to hide in secrecy. Sharing your fears with an understanding friend or counselor will usually help dispel some of the fear. Don’t Engage the Drama– By-pass worst-case scenarios. We never know what’s going to happen, so why imagine the scariest possibilities? Fear feeds on drama, and will multiply the more we engage. Practice stepping away from the drama, and imagining better-feeling scenarios. Avoid unnecessary hesitation – The more you hesitate, the more your mind will interfere to tell you all the reasons why you should fret, worry, and not take that courageous action step you planned to take. Commit Yourself in Advance – Schedule your courageous acts ahead of time. Then, show up. Do it with a friend – Practice with a friend. Celebrate together as you take courageous action steps. Start Small – It can be hard to find courage to do something that feels big and scary. Instead, take a good look at the big and scary goal, and then break it down into smaller, friendlier steps. Enter a state of non-resistance. 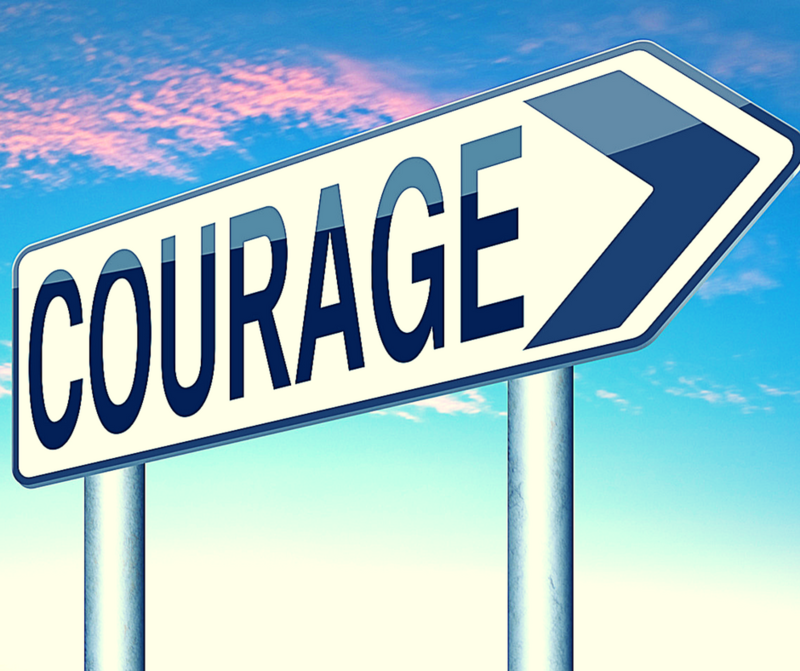 – Courage can be tough to muster when we’re dreading doing something. Practice letting go of resistance, and being present with whatever happens along your way. Tap into your BIG WHY – Why do you want to use your courage? Get clear about your true, authentic intentions. When we feel really inspired and motivated, sometimes we’ll do just about anything to get what we want. Visualize Best Outcomes – Visualization is a very powerful technique to help us imagine our best outcomes. By visualizing what you want, you will activate your reticular activator to help you begin to see evidence of what you’re visualizing. By allowing yourself to feel the energy of your imagined scene, you can boost both your enthusiasm and your courage. Do Things that Others Don’t. – Practice following the beat of your own drum. The more comfortable you are doing your own thing, the more courage you will have to do anything. Turn Obstacles and Failures into Assets – It’s easy to use obstacles and failures as excuses to forgo our courage. By turning obstacles and failures into opportunities to learn and grow, we can bypass fear, and move forward with courage. This fortifies our courage to continue, despite obstacles or failures along our way. Expand Your Knowledge – Many times we’re scared of what we don’t know or understand. By increasing your knowledge about a particular area, you will increase your confidence and courage to explore areas you might previously have avoided. Incremental Exposure – Little by little, expose yourself to the thing that you fear. Imagine How You’ll Feel after You Do It. Imagining how good you’ll feel once you take action will boost your enthusiasm and your courage. Exercise – Any form of exercise will help release pent-up stress and anxiety. In addition, you will strengthen your sense of confidence as you follow through with regular exercise. Confidence nourishes courage. Meditation – Meditation will help you feel centered, grounded, and relaxed. When you come from a place of centered calm, courage is much easier to access. Affirmations – Affirmations, when frequently repeated, will assist your subconscious mind in helping you feel more courageous. Create a few short, easy-to-say, affirmations. For example: “I love feeling courageous.” Or “My courage brings success.” Repeat throughout your day, and/or for 2-5 minutes at a time. Remember — repetition increases the power of an affirmation. Heart Breath – The heart breath will help you drop out of a worried, stressed mind, into the peace and wisdom of your heart. To do the heart breath, close your eyes and take a few long deep breaths. Next, continue to breathe deeply while imagining you are breathing in and out of your heart. Continue to breathe this way for 1-5 minutes. EFT Tapping – EFT Tapping, tapping on specific acupressure points on the face, torso, and hand, helps to reduce cortisol, the major stress hormone. Calming your nervous system is an important first step in cultivating courage. 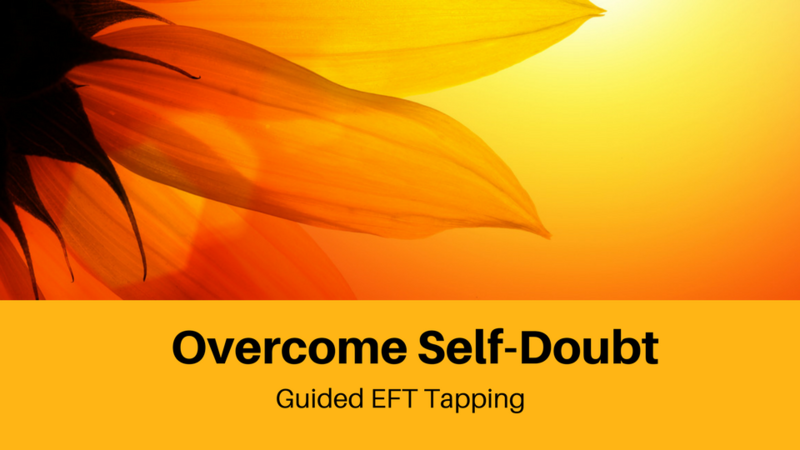 Contact me at marian@marianbuckmurray.com if you’d like to learn more about EFT Tapping. Our Beautiful World Needs YOUR Courage! It’s Time to Feel GOOD! With so much disconcerting news lately, it can feel impossible to get away from it all. And, it’s oh, so easy, to get sucked in and pulled down along with it. When I get dragged into the unrelenting muck it often triggers a jumble of feelings — ranging from irritability and anger to sadness, and fear. If I allow it, it can be truly paralyzing! When I’m triggered with unwanted feelings, it’s hard to get anything done — especially anything creative. Fortunately, I’ve tried and tested a number of very effective techniques that help me feel better — quickly. I’ve always been all about feeling good. I thrive on feeling good and I thrive on finding ways to feel good when I don’t. And, I’m passionate about helping my clients feel great! For me, feeling good is absolutely crucial in order to do the work I do. Here are some of my all-time favorite mood-boosting techniques. Remember — the subconscious mind, and the body, need to be continually nourished with positive input in order for you to feel your best. Use Affirmations – Write down 3-5 feel-good affirmations that you can say to yourself throughout the day. For example: “I am successful.” “I love the work I do.” “I feel energetic and alive.” Repeat these affirmations often. Repetition will help imprint the affirmations into your subconscious, helping them become automatic beliefs. 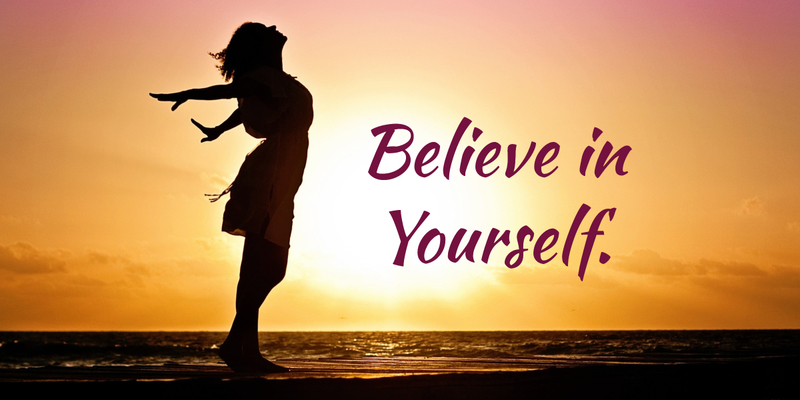 Acknowledge Yourself — Create a list of 25-50 of your accomplishments and personal qualities that you feel good about. Keep this list handy. Refer to it on a regular basis, to remind yourself of all of the good within you. Do Something Nice – Surprise someone with a kind gesture or gift. Send a thank you note to a friend, client, colleague, or family member. Offer to do something challenging for someone. Volunteer your services. Delight in the pleasure of helping someone else feel good. Dance to a happy song – Create a playlist of happy songs. Take a break and dance (and/or sing) to one or all of them. Keep them handy for regular use. Read Uplifting Quotes – There are a number of websites that specialize in a variety of quotes. Search for uplifting, positive, inspiring quotes. Keep a list of your favorites. Post them where you will see them. Write a Gratitude List – Write a gratitude list, daily. As you write your list, tap into the feeling of gratitude. Gratitude is a very uplifting feeling, and will help you lift your spirits, and raise your vibration. Meditate – My indispensable go-to. Meditation works. The act of sitting in stillness helps to clear and center the mind. Starting the day with meditation helps to keep the day centered, no matter what’s going on. Nourish Your Body — A nourishing diet is absolutely crucial for optimal energy and mood. For best results, eat plenty of alkalizing green vegetables, colorful fruits and veggies, good fats, fiber-rich whole grains, lean proteins, and probiotics. Drink plenty of water, and minimize caffeine and alcohol. Move Your Body — Moving your body will help you release built up tension. Do some quick yoga. Take a Nature walk. Get up and stretch. Dance. Go to the gym. Work out to a video. Enjoy! Use EFT Tapping –– EFT Tapping is one of the most effective techniques for reducing the stress hormone cortisol. Just using your fingertips to tap on your Karate Chop, while breathing deeply, is enough to promote a sense of relaxation. Click here for an illustrated description of the EFT Tapping Points. Contact me to find out how EFT Tapping and Matrix Reimprinting can help you feel your best!